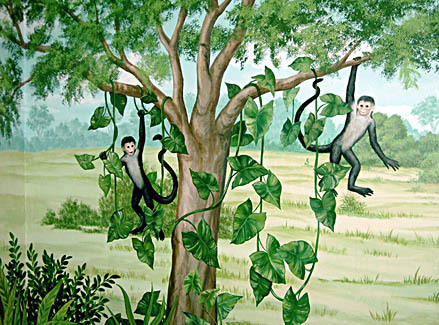 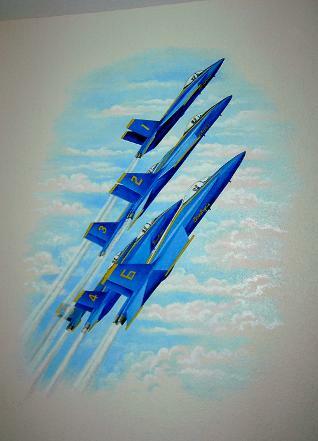 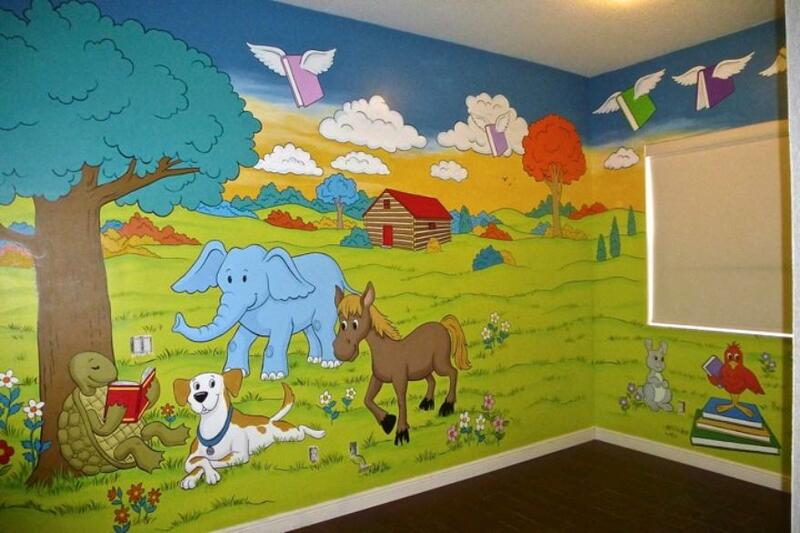 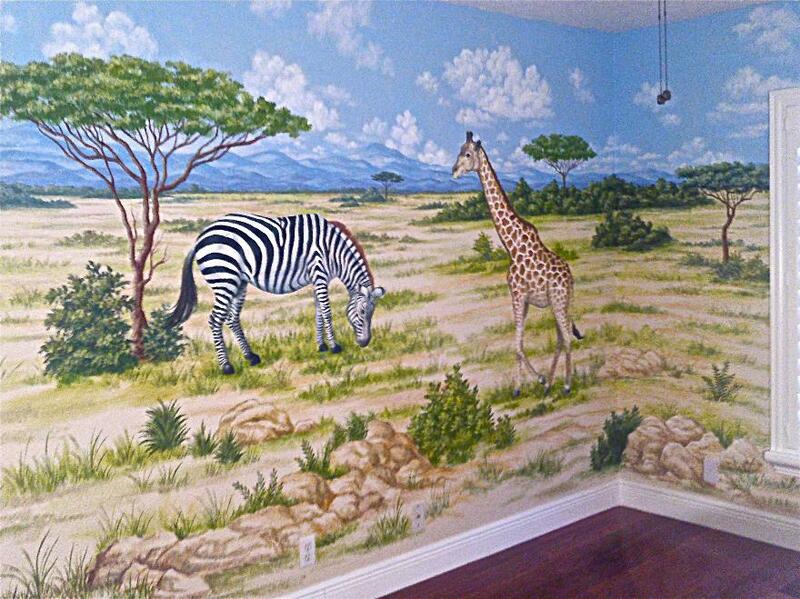 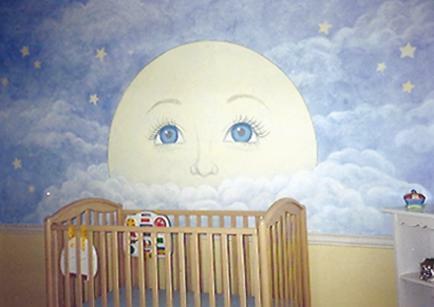 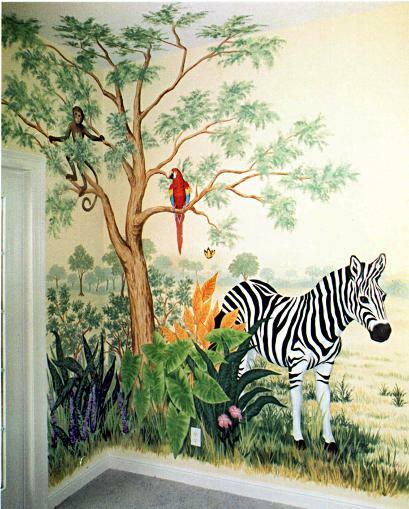 I paint custom murals for kids' rooms and nurseries in Dade, Broward, and Palm Beach Counties. 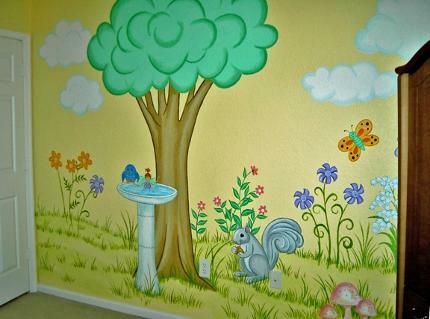 fairies, animals, or story book characters, there is sure to be a design just perfect for your child. 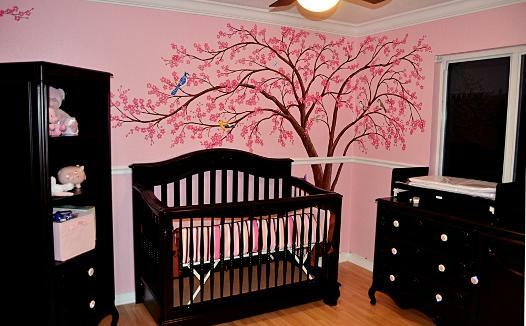 birds, topiary trees and ribbons randomly painted. 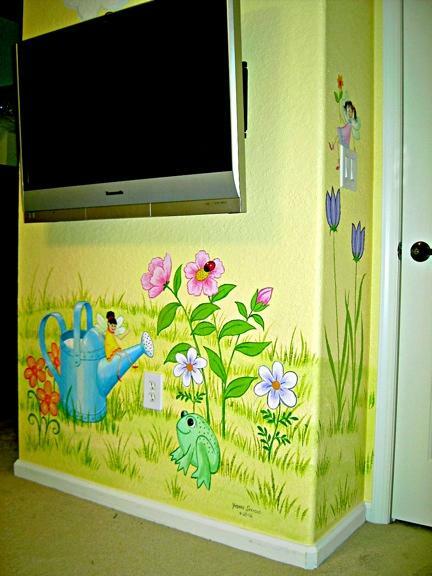 Simplicity can be the key. 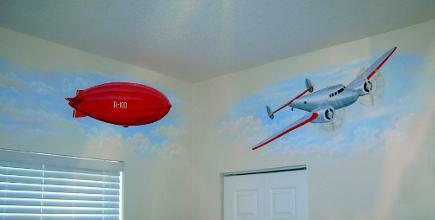 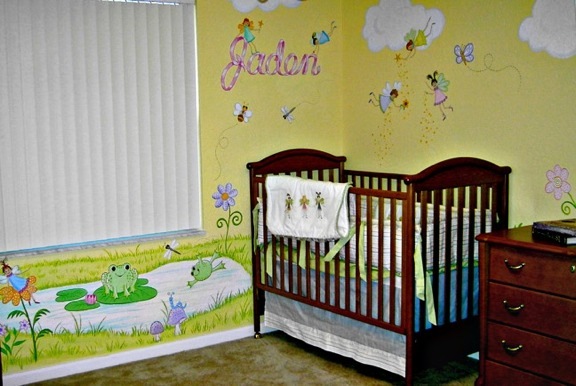 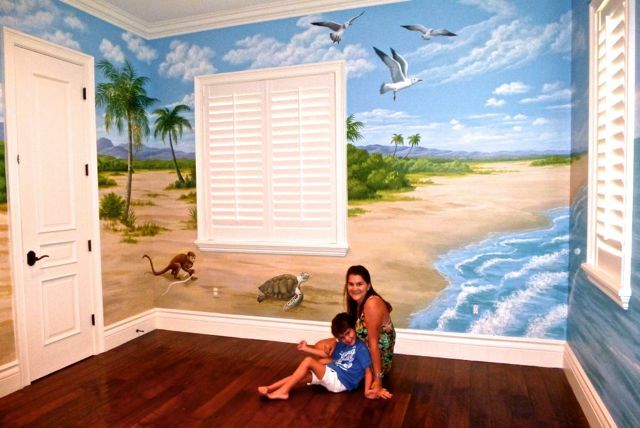 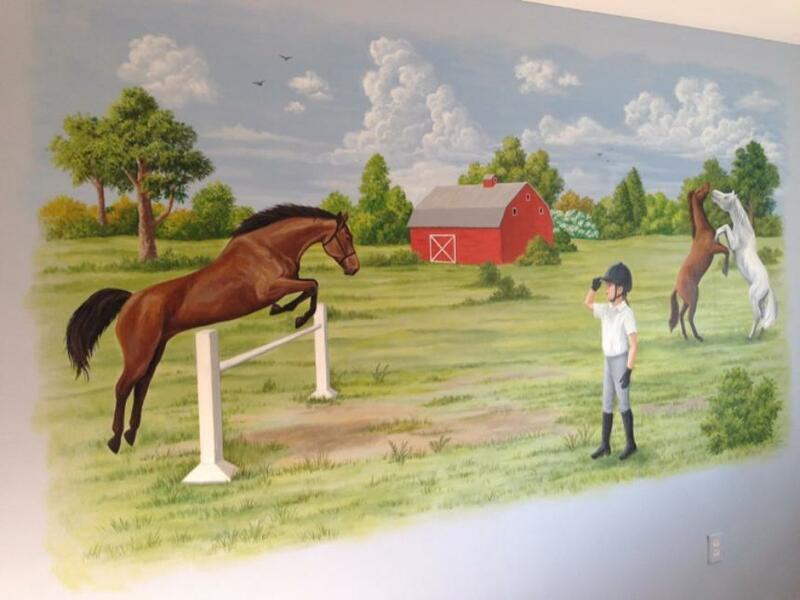 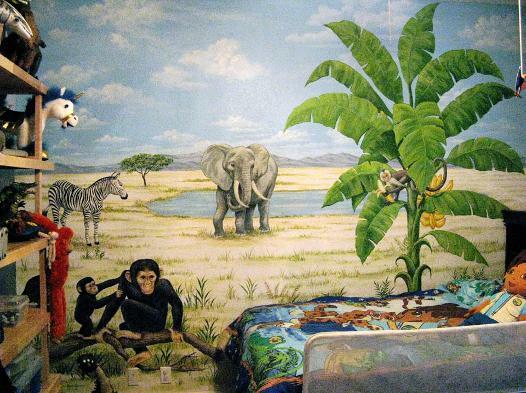 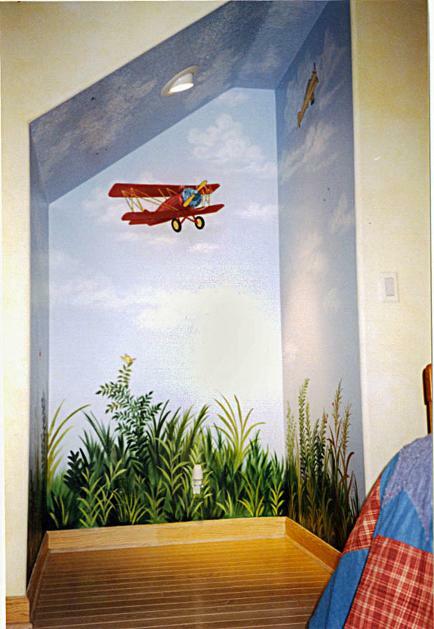 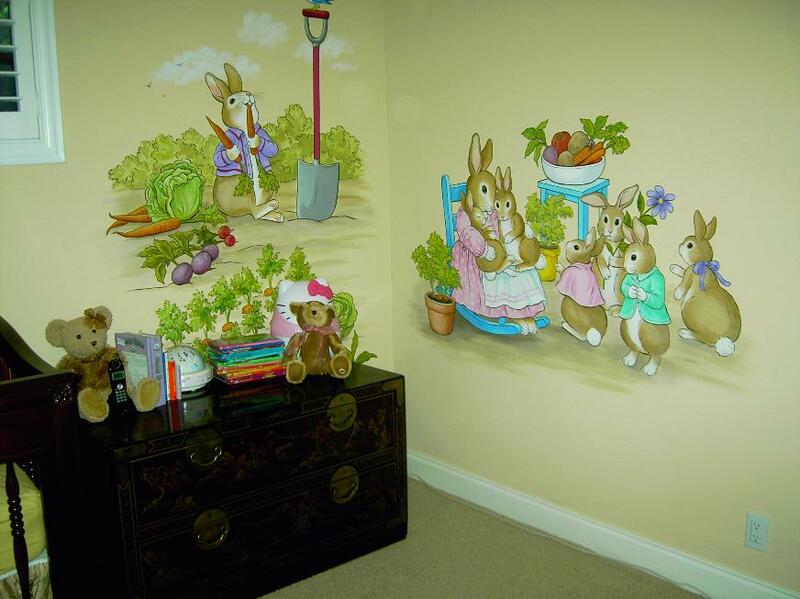 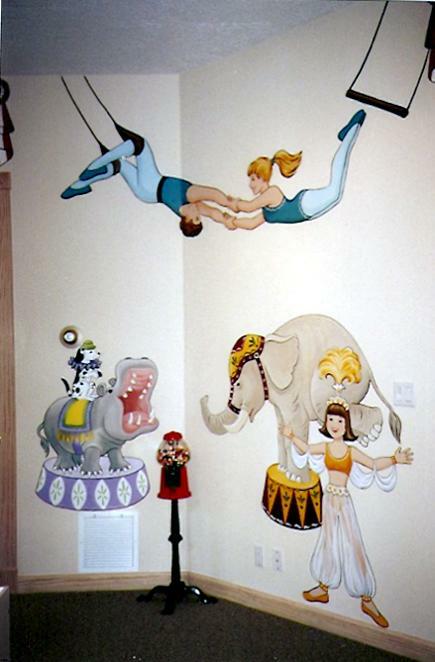 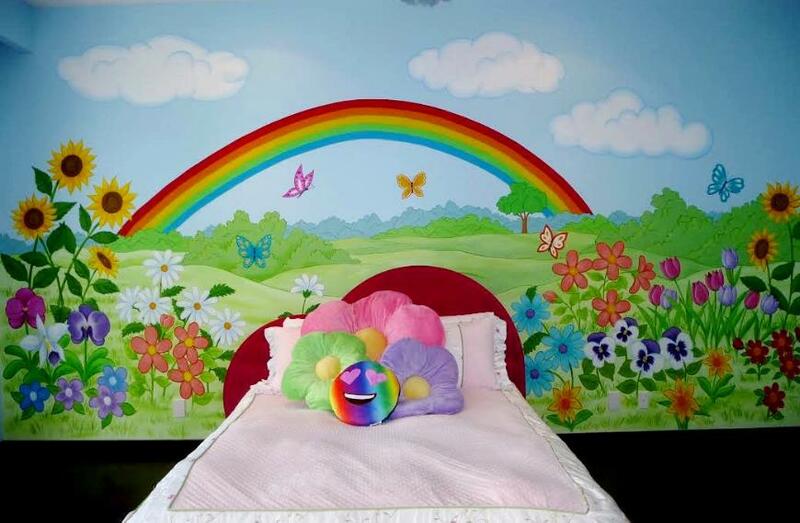 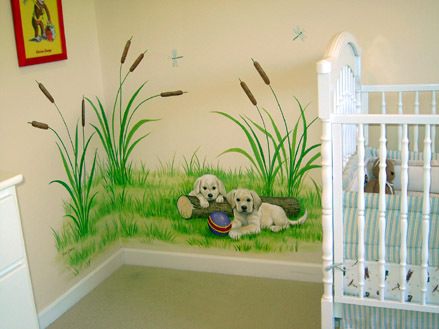 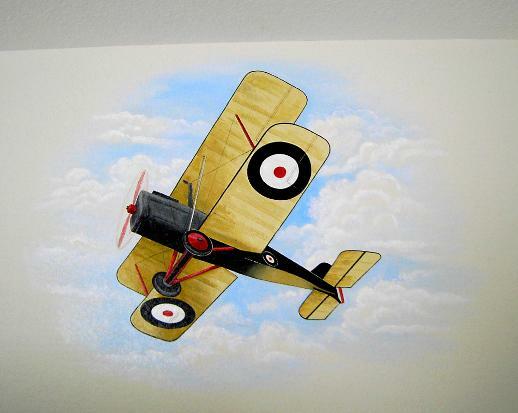 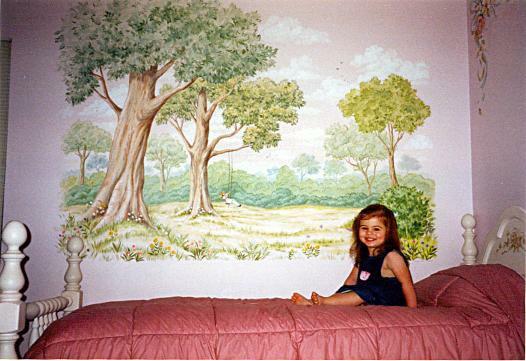 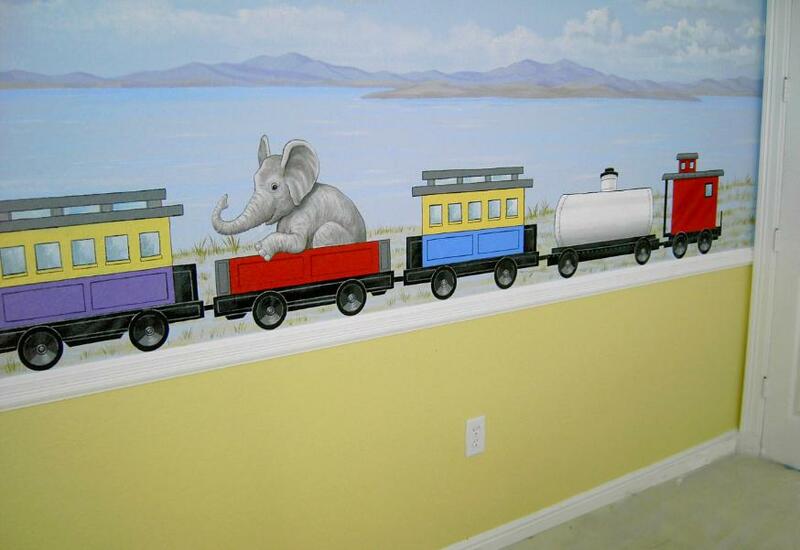 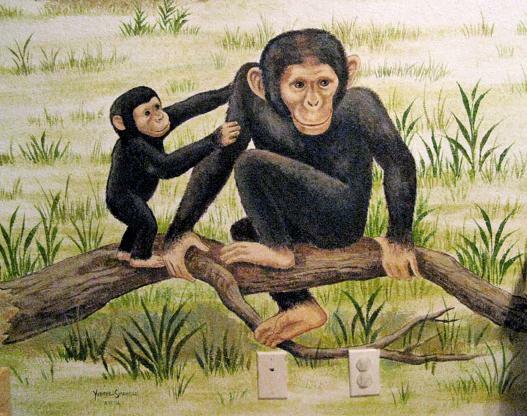 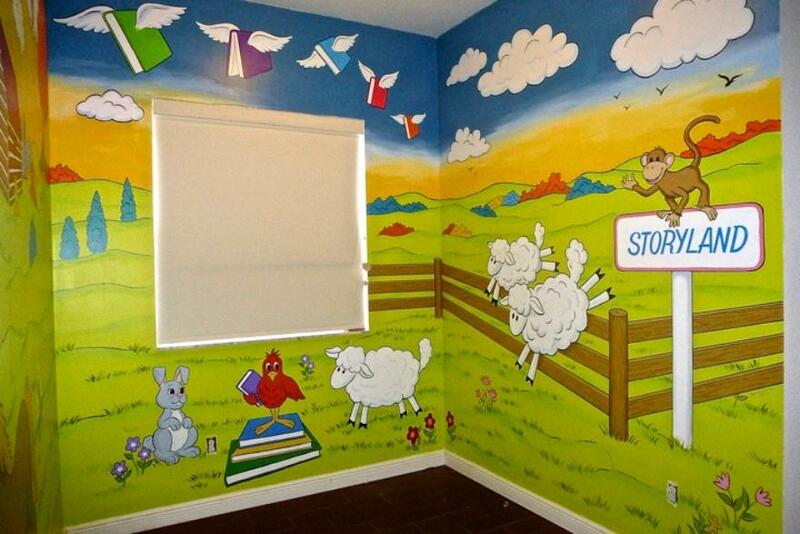 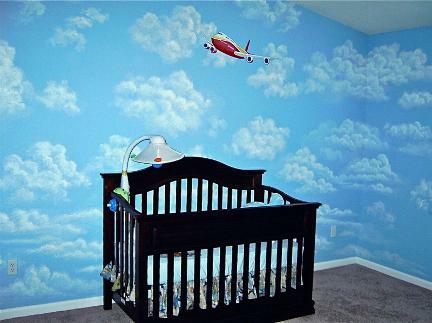 My custom murals are sure to fulfill your child's imagination! 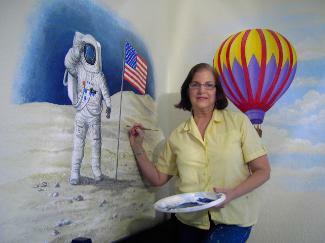 CLICK THE CATEGORY TABS ABOVE TO SEE MY COMPLETE PORTFOLIO. 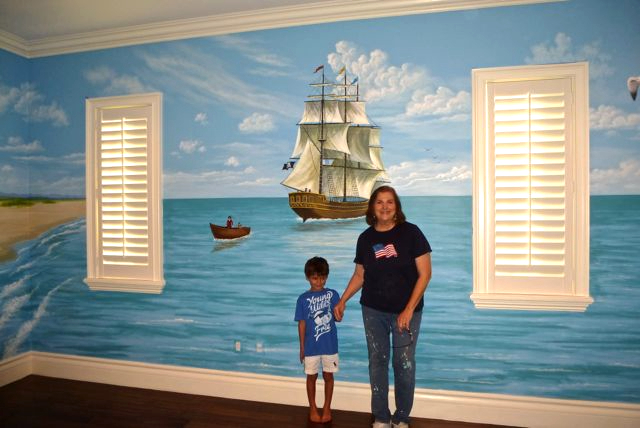 PIRATES WITH FOUND TREASURE: This mural was painted in a boy's room, and surrounds all 4 walls. 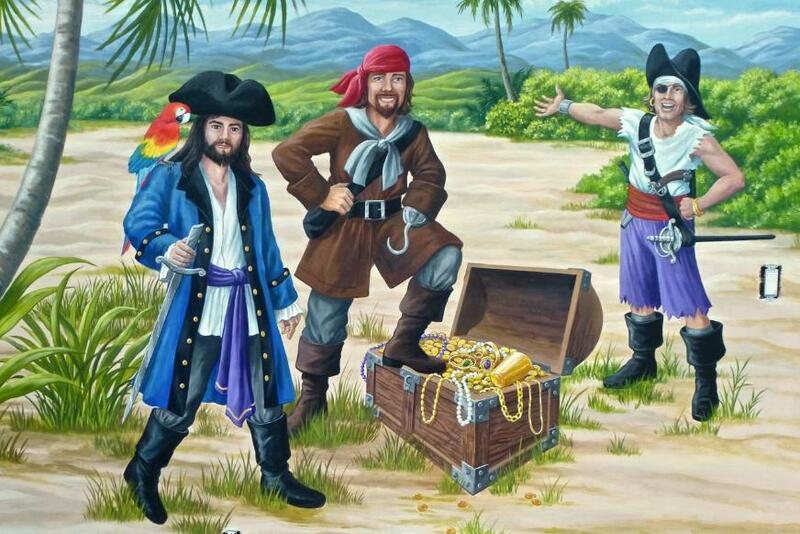 As it continues around the room, left to right, you can see that it pans from the pirates with their treasure, to the shore, and out to sea where their ship is moored off shore. 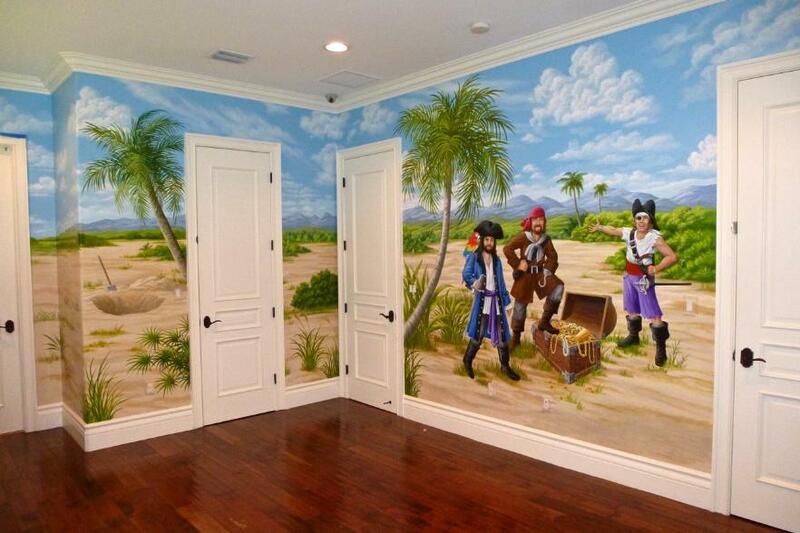 Below are the pirates in closer detail, and the next two images which show the surrounding walls of the room. 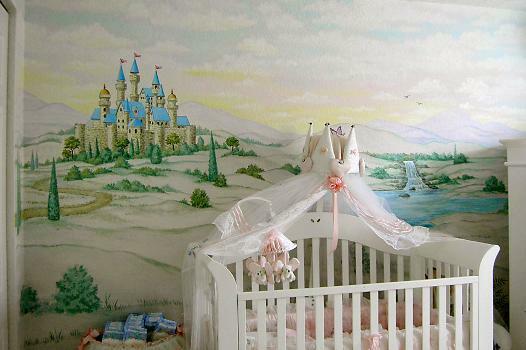 A custom-designed "pirate ship" bed would be added to the decor. 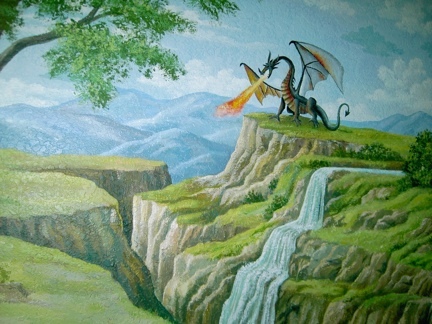 Below: As a commercial illustrator for many years, I am quite versatile when it comes to different styles and techniques in my painting. 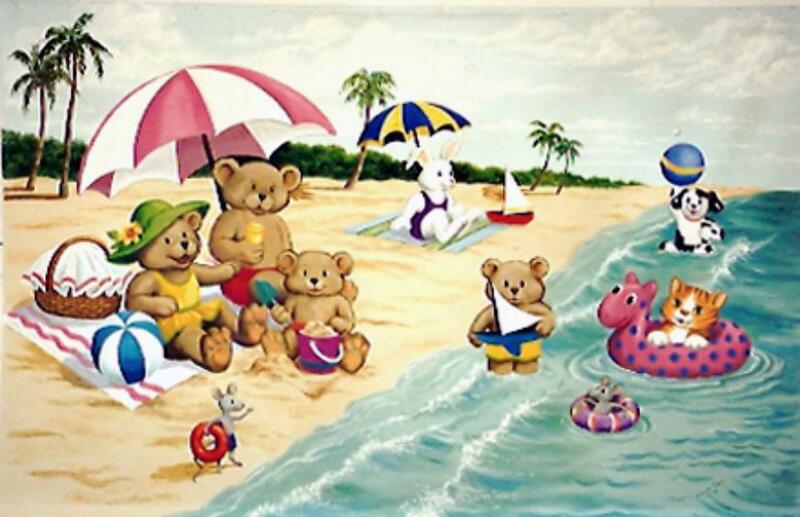 My natural instinct is to paint in a realistic style. 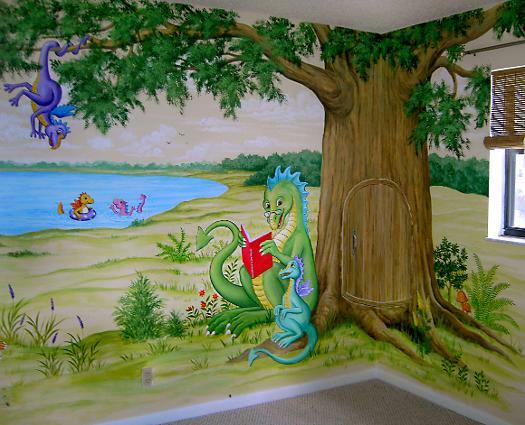 But in the case below, the client requested a cartoon style, using surrealistic bright colors to surround a "reading nook" for his little girl, with flying books and animals enjoying a story read to them by a tortoise. 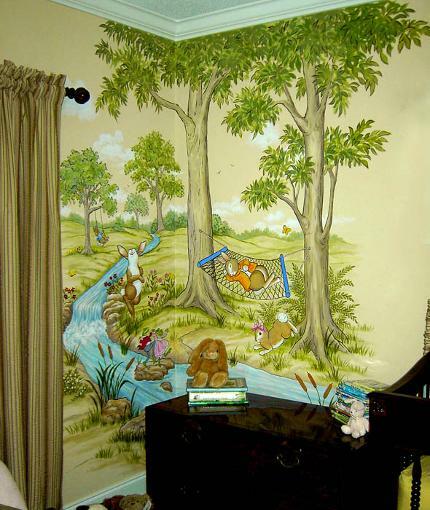 He included an easy chair where he would sit and read each evening to his daughter. 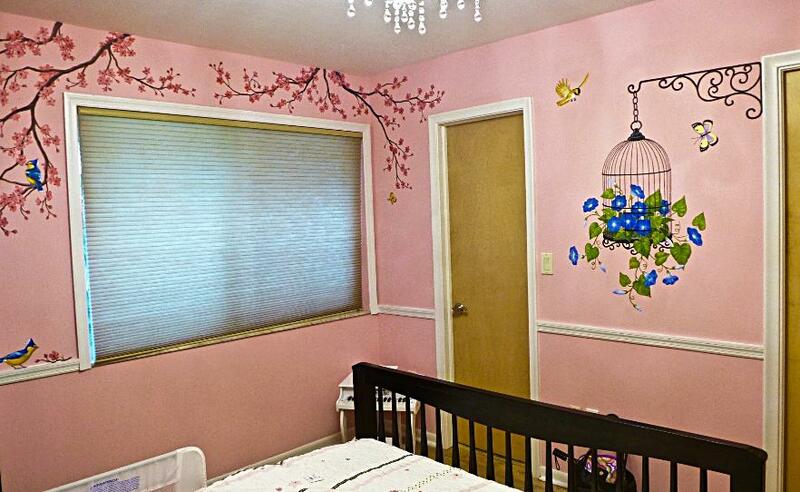 Above and Below: Cherry Blossoms adorn the walls of a little girl's room, and a decorative bird cage filled with Morning Glories. 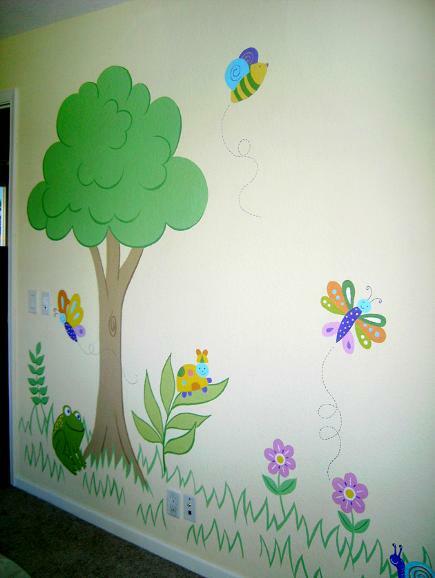 Of course, we could not leave out the birds and butterflies! 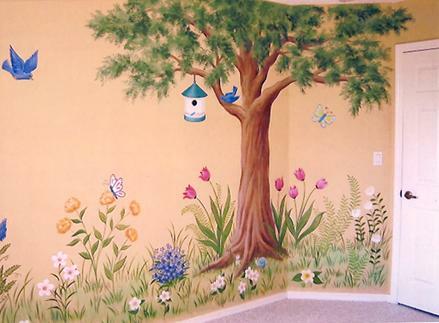 Above: Fairies, flowers, bees and a tree. 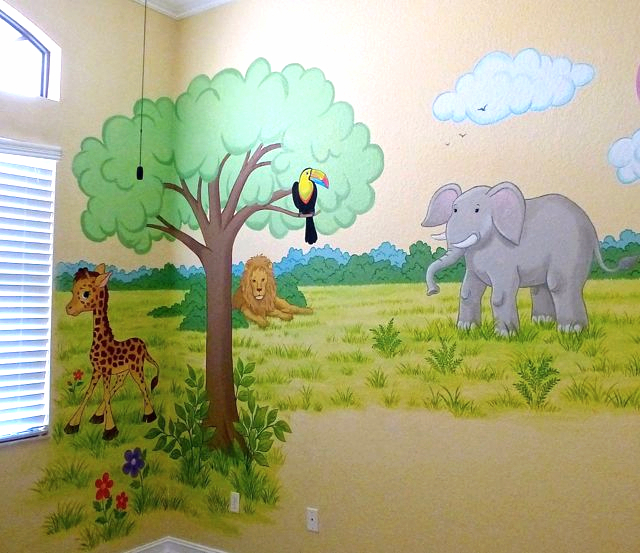 Perfect for a little baby gir's nursery. 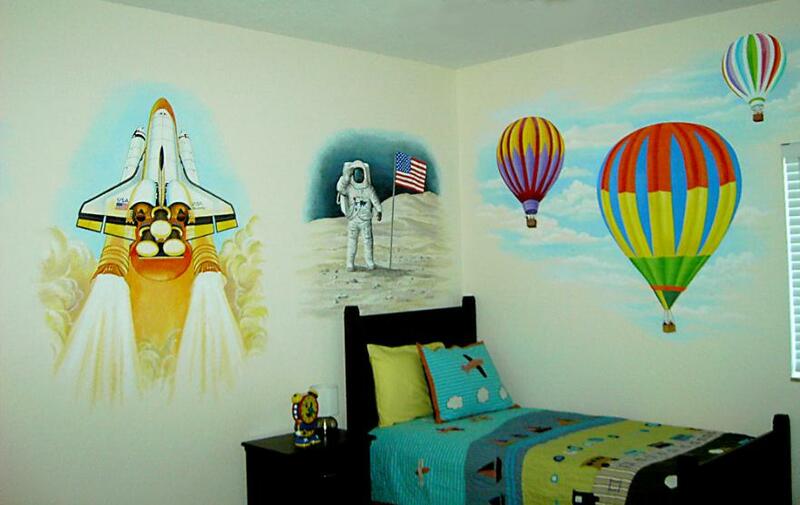 Below: Depicting the many different stages of flight, from hot-air balloons, to airplanes, to jet planes and rockets, bringing man to the moon, this mural surrounds all 4 walls of a boy's room. 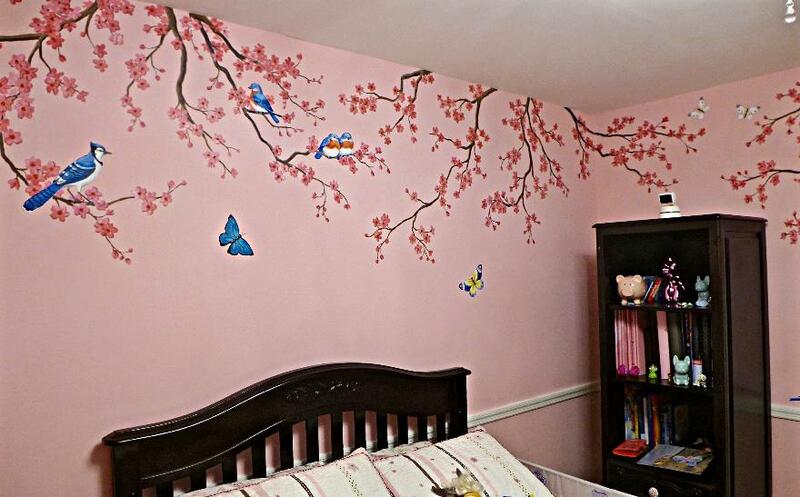 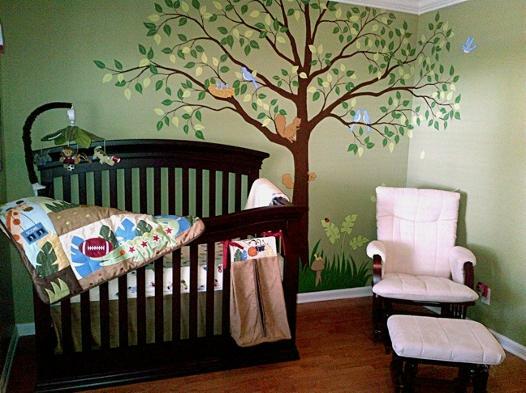 Above: Cherry Blossom Tree with Birds and Butterflies for a new baby girl's nursery. 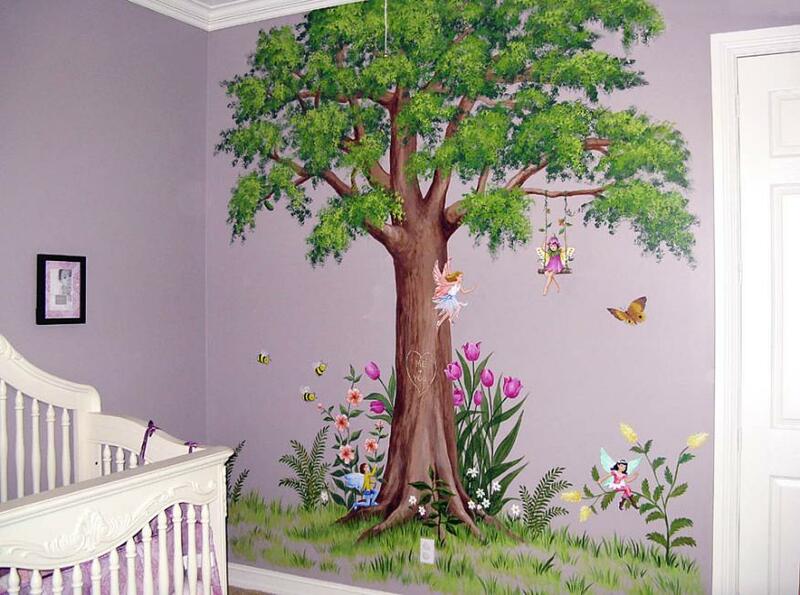 TO A CHILD THAT YOU LOVE! 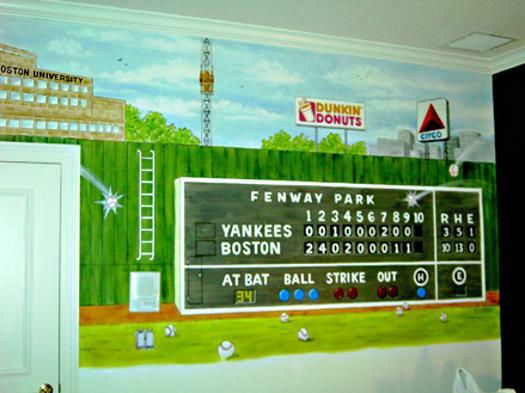 Below: Murals with sports themes are very popular. 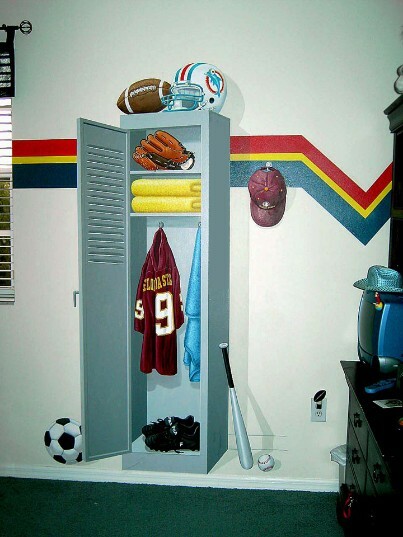 The sports locker below is a classic example of Trompe L'Oeil, a French term meaning "to fool the eye". 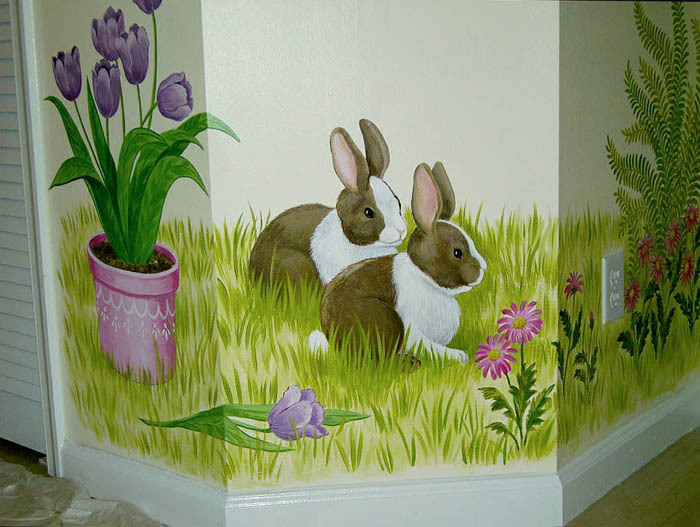 Consider the fine quality of artwork done on these murals. 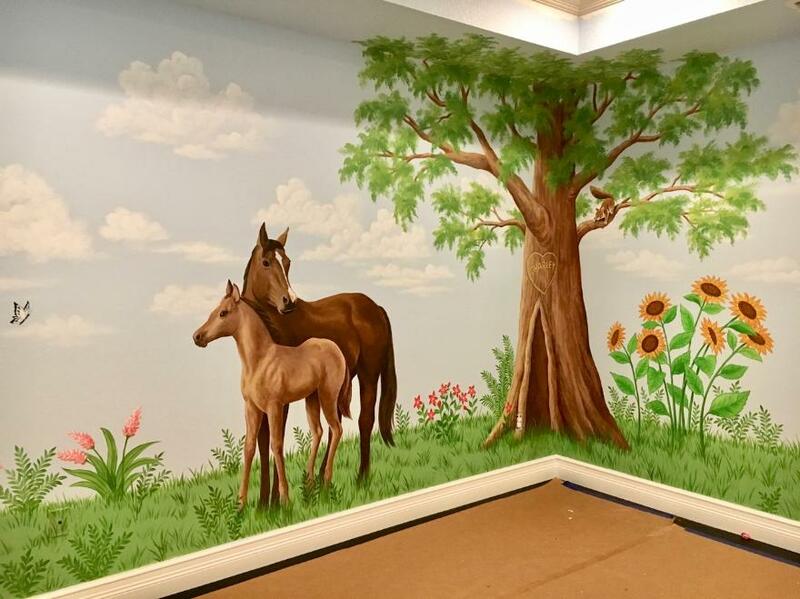 When you call on me to paint for you, I can assure you that the end results will be enjoyed by you and your children for years to come.